Haq's Musings: World Economic History: Was India Ever Rich? When the British arrived in Mughal India, the country's share of the world GDP was 25%, about the same as the US share of the world GDP today. By 1947, undivided India's share of world GDP ($4 trillion in in 1990 Geary-Khamis dollars) had shrunk to about 6% (India: $216 billion, Pakistan: $24 billion). Since independence, India's contribution to world GDP has shrunk further to about 4%, according to British Economist Angus Maddison who died in 2010. The colonization of India and many other nations in Asia and Africa began with the advent of the Industrial Revolution in Europe which resulted in a major power shift from East to West over the time-span of just a few decades. Prior to the Industrial Revolution, the world depended mainly on agriculture based on human and animal muscle power. Countries with large populations and farmlands had large share of the world GDP. The per capita productivity differences among nations and regions were relatively small. The machine age changed it all. Those who used machines became much more productive and significantly richer than the rest. 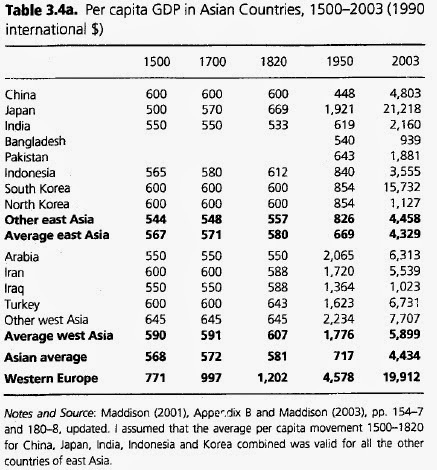 In 1000 AD, according to British Economist Angus Maddison, China and India together accounted for more than half of the world GDP (calculated in 1990 dollars in terms of purchasing power parity). By 1600, that share was 51.4%, with China accounting for 29% and India 22.4% of world GDP. A hundred years later, China’s GDP had fallen but India’s went up to 24.4% of world output. By 1820, however, India’s share had fallen to 16.1%. By 1870, it went down to 12.2%. International Monetary Fund (IMF) projections indicate that India’s share of world GDP would be 6.1% in 2015. While it is a fact that India's total GDP was at one point the highest in the world, does it mean that the average Indian was richer than his or her counterparts elsewhere in the world? To answer this question, let's look at Maddison's figures for per capita GDP in various parts of the world. In 1 AD, India’s GDP per capita was $450, the same as China’s. But Italy under the Roman Empire had a per capita income of $809. 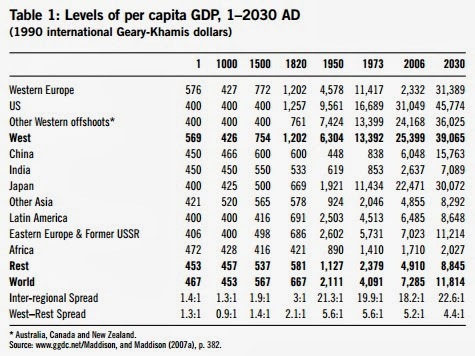 In 1000 AD, India’s per capita income was $450 and China’s $466. But the average of the Islamic Caliphate in Baghdad which ruled West Asia (Turkey, Syria, Iran and Iraq) was much higher at $621. An average citizen of the Abbasid Caliphate was richer than an average Indian or Chinese. In fact, the per capita income in the Abbasid Caliphate was the highest in the world in 1000 AD. As the European Renaissance began, new centers of prosperity emerged. Italy topped the table in 1500 AD, with per capita income of $1,100, the Netherlands following with a per capita income of $761. The UK was not far behind, with a per capita income of $714. All of these nations were richer than India and China which had per capita incomes of $550 and $600 respectively. While India today has the world's largest population of poor, it is still richer than it has ever been in terms of per capita incomes. Indians are also living longer than ever in the country's history; average life expectancy in India has risen from just 23 years in 1800 to 65.5 years now. However, India continues to significantly lag the rest of the world on both economic and social indicators. Well India has an economic history atleast 2000 years prior to 1AD. Also the exact way in which you arrive at per capita income for time periods centuries before modern statistics is deeply suspect. I would say Hindu India went into decline in the 6-7th century.Almost all of Hindu India's world shaking inventions and thoughts The decimal number system,aryabhatta(sun is a star accurately calculated diameter of earth and described it as a spere),bhaskara,schools of philosophy,world renowned universities(Taxila,Nalanda),Ayurveda,Yoga etc etc reached its peak well before that. Viewed dispassionately the Islamic conquest of most of North India coincides roughly with the sacking of baghdad and the decline of muslim civilization as a result.Muslims in India made wonderful architectural monuments but little in way of intellectual acievements so common in their coreligiosts during the Islamic Golden age. A slow painful recovery started under the British (renaissance via induction if you like) which continues to this day.I think it will take India atleast 50 more years to become a reasonably developed country. Anon: "Muslims in India made wonderful architectural monuments but little in way of intellectual acievements so common in their coreligiosts during the Islamic Golden age." It wasn't just Muslims but the entire eastern hemisphere, including China, that missed the Industrial Revolution and became colonized. The shift in power was not just in economic terms. Enabled by machines such as steamboats and weapons like the repeating gun, the West engaged in long distance trade and warfare that led to the colonization and exploitation of Asia and Africa. The new colonies were used as a source of cheap raw materials for European factories and the colonized people served as captive customers for their manufactured products. While development of Asian and African nations stagnated and their share of world GDP dropped precipitously, their colonial rulers in the West prospered. Social indicators like literacy and life expectancy showed little improvement in the colonies, according to data compiled by Professor Hans Rosling. 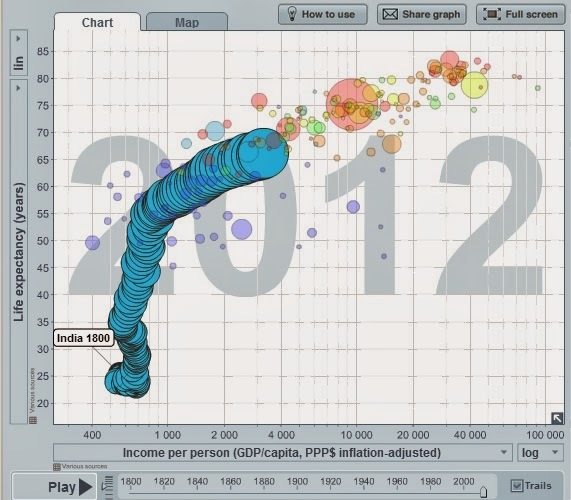 For example, his Gapminder.org animations show that life expectancy in India and Pakistan was just 32 years in 1947. In Pakistan, it has jumped to 67 years in 2011, and per Capita inflation-adjusted PPP income has risen from $766 in 1948 to about $3000 in 2011. Similarly, literacy rate in undivided India was just 12% in 1947. It has increased to about 67% in India and 62% in Pakistan for people 15 years and above. "....Almost all of Hindu India's world shaking inventions and thoughts The decimal number system,aryabhatta ..."
Frankly speaking the only earth shaking things that came out of India were Zero and Buddhism. The rest has no or little effect on the world at large. That is why if you look at the list of Indian inventions on Wikipedia, they resort to proudly say the luddo was invented in India. I am trying to recall where I read this, but when British left Subcontinent, its share of world trade was around 10%, Indian's manage to shrink that to around 2% in 50+ years. Well genius that is because in 1947 India was relatively undamaged by WW2 and Japan and most of Europe were temporarily out of business.As they recovered India's share would have fallen below 5% regardless of any policy. In addition most of the trade involved exporting raw materials and importing finished goods safety pins upwards i.e. terms of trade that caused pauparization of the subcontinent in the first place. We had an industrial base to build which kicking and screaming we more or less built.Throughout the so called Hindu rate of growth period our industrial growth averaged 6-7% skewed towards heavy industry and the higher educational base to complement this IIT,IIM,IISc etc were built alongside as well. Being British, I remember that India and Pakistan were very similar in broad economic terms in 1947. Pakistan had a higher percentage of irrigated land and food processing units while India had a slightly better industrial base. Pakistan may have been richer by a little and India a little more literate. India had a higher population density than west Pakistan but similar to east Pakistan. Today it seems India may be better off than Pakistan economically just because Pakistan has been mired in greater amount of conflict than India. Therefore, India maybe at a platform where it could take off but not the same Central Planning way China did. Edmund: "Today it seems India may be better off than Pakistan economically just because Pakistan has been mired in greater amount of conflict than India. Therefore, India maybe at a platform where it could take off but not the same Central Planning way China did." Both India and Pakistan are agrarian societies with 60% of Indians and 40% of Pakistanis engaged in agriculture. The difference between India and Pakistan is that agri value added in Pakistan is twice that of India. The result of lower farm productivity and deep rural poverty in India is manifesting itself in an agrarian crisis which has forced over 200,000 Indian farmers to take their own lives in the last decade. Nizar: "Pakistan GDP per capita for 2013 is $3100! CIA Factbook"
The latest figures in the post are for 2003 in terms of 1990 Geay-Khamis international dollars. Gear-Khamis dollar is based on the twin concepts of purchasing power parities (PPP) of currencies and the international average prices of commodities. It shows how much a local currency unit is worth within the country's borders. It is used to make comparisons both between countries and over time. For example, comparing per capita gross domestic product (GDP) of various countries in international dollars, rather than based simply on exchange rates, provides a more valid measure to compare standards of living. It was proposed by Roy C. Geary in 1958 and developed by Salem Hanna Khamis between 1970 and 1972. Bangladesh was far behind India and Pakistan but is now not too far behind. Our 2013 exports were higher than Pakistan. Aminul: "Our 2013 exports were higher than Pakistan"
Look at the GDP instead...Pak GDP is twice that of Bangladesh. As to exports, Bangladesh is a one-trick pony that relies heavily on its sweatshops (death traps) making cheap garments. "Pak GDP twice that of Bangladesh"? Bangladesh 2083 and Pakistan 3100, how is that twice? Also, IMF estimates in 2018 Bangladesh will be 3010 and Pakistan 3799. Please research the IMF website before you say something wrong. Aminul: "Bangladesh 2083 and Pakistan 3100, how is that twice?" Look at total nominal GDP for 2012. More than a hundred kids have died of hunger in Sindh. How many have died in BD? BD is the success story of SA along with SL. Indo-Pak can doob maro in chullu bhar pani. On paper BD and Pak look similar, but why is it that there are about one to three million Bangldeshis living in Karachi illegally and doing menial jobs? Go to any upper / upper middle class house in Karachi's Deffance or Clifton area and the chances are that you will find a Bangladeshi working as a cook. In PPP GDP of Pakistan will be $698 billion in 2018 and Bangladesh will be $506 billion per IMF estimates. That means Bangladesh will be growing faster than Pakistan in the next five years considering in nominal GDP terms Pakistan is twice as big. According to a report by the World Bank released on Tuesday, India has surpassed Japan to become the world's third largest economy in terms of purchasing power parity (PPP) (Indian Express, Economic Times). Using data from 2011, the International Comparison Program reveals that India went from being the world's 10th largest economy in 2005 to the world's 3rd largest in 2011. According to the report, India accounts for 6.4 percent of the world's GDP in terms of PPP, ahead of Japan's 4.8 percent, but is far below China, which generates 14.9 percent of the world's GDP in PPP terms and the United States (17.1 percent). FORBES: "India Becoming Third Largest World Economy Is A Sign Of Failure, Not Success"
An interesting little point following on from the CEBR report into the size of national economies. Of course, as we would expect, reports from different countries about the same report note and detail different facets of said report. So we’ve a report out of SE Asia that looks at the way in which India is set, within the decade, to become the largest economy in the Commonwealth and the third largest overall. This is being seen as a sign of success, of their doing something right. Which is true in a trivial manner: but the greater truth is that this is a sign of the failure of previous policies. The latest edition of Cebr Global’s World Economic League Table (WELT) will see the “unstoppable” rise of India as it surpasses Britain to become the largest economy in the Commonwealth in 2018 and the third largest economy in the world by 2024, according to a new global league table reported by the Press Association. This is all good stuff, of course it is. It’s just wonderful that places that are currently poor are becoming richer. And yes, at least part of it all is that better public and economic policies are being followed in those formerly poor nations, the very things and policies that are making them richer. However, we also need to consider some other points. For example, it’s not the economic output of a certain group of people within certain arbitrary lines upon the map that really matters. It’s how many people there are and what standard of living they each have that is. And if we look at countries by population, by GDP and by GDP per capita, we find very different answers. If all countries were doing equally well in providing a lifestyle for their citizenry then we would expect the world’s largest economies to be those with the largest populations. And this isn’t quite so: it’s only just now that China, with four or five times the population, has passed the US as the largest economy. And India is still well behind, despite a similarly larger population. Meaning that the US is doing four or five times better than China in providing a living standard to its people than China is: and obviously yet again better than India. So, yes, obviously it’s good that these poor countries are getting richer. But it’s not an unalloyed joy: because when we look on a per capita basis then we can see how far they’ve still got to go. And of course that means that while current policies must be better than those that went before, it also means that past policies were really pretty bad. One of the things that bothers people so much about Russia's slow play to gobble up chunks of Ukraine is that countries, by and large, have stopped annexing each others' territory since World War II. This modern success is all the more remarkable by the fact that, for most of history, countries loved to conquer land and subjugate the people living there. European colonialism has been far and away the worst offender in this regard in the last 500 years. Take a look at this GIF charting the rise and fall of (mostly) European empires from 1492, when the European discovery of the Americas kicked off their movement west and south, to 2008. A lot of interesting things pop out in that GIF. Thailand never gets colonized by any power, European or Asian. Denmark had the earliest westward European colonies, in Greenland. The Japanese empire was pretty huge in 1938. But the biggest, most remarkable thing in the map is the ebb and flow in the territory controlled by the big European powers. That reflects a few things. Wars between great powers themselves (say, World War I), colonial conquest (Britain in Australia), conflict between colonial powers (Britain and France in North America), and colonized people throwing out colonizers (the dramatic decline in African colonialism after World War II). The rise and fall of colonial empires warrants particular attention. Each of these sometimes-century long occupations that transformed daily life for colonized people. These regimes varied in all sorts of ways: the degree to which they literally enslaved colonized subjects, to take a particularly grim example, or the amount to which they allowed local political autonomy. Scholars are still arguing over the implications of these massive colonial shifts for modern politics, which are undoubtedly dramatic. Take the big-picture global economy: why some countries are rich, and others are poor. Daron Acemoglu, Simon Johnson, and James A. Robinson have proposed that colonialism created a "reversal of fortunes" in economic terms. Previously rich peoples became poor when colonized, while previously poor peoples ended up comparatively wealthier. And both, by and large, remain so today. Why? Well, the central purpose of European colonialism was to benefit and enrich Europeans. Acemoglu, Johnson, and Robinson propose that created different incentives for European powers in richer and poorer colonized lands. In richer places, they built governments whose task was to steal wealth and resources and send them to Europe, shattering the foundations of local prosperity. In poorer places, they actually built European settler communities, protecting economically useful institutions like private property rights in order to make these communities do well. In both previously poor and previously rich places, these colonial institutions altered the trajectory of their development down to the present day.